They say the only constant is change, and this is certainly true of business leadership. Any organization can count on changes in personnel in key roles at some point, whether due to retirement, natural career progression, or a variety of other reasons. A sudden vacancy in a critical operational role cannot only leave an organization scrambling to fill in, but it may also leave a significant gap in knowledge and experience that takes time to rebuild. Many companies are not prepared for the departure of key personnel: a Stanford University report found that 33% of companies don’t have successors ready to fill key C-suite positions. [i] And respondents to a KPMG global survey reported insufficient pipeline of future leaders and lack of internal candidates for critical roles as their top two talent management concerns. [ii] That’s why it’s so important to put succession management strategies in place ahead of time and minimize the effect these inevitable changes have on business operations. Succession planning is a process to identify the next generation of leaders in your organization who have the potential to fill key roles when the current personnel move on. This provides your company with a roadmap to ensure continuity of your operations when changes occur. And it allows time to develop the future leaders’ knowledge and skills, so they are prepared when the time comes to step into their new roles. The first step in creating a succession plan is to identify which key positions you should include in the plan. Essentially, you need to identify which roles have the greatest impact on your company’s performance, and would also be the most difficult to replace. [iii] Selecting the right positions to focus on is important to the successful outcome of your plan. So, how do you decide which roles are critical? When assisting clients with developing their succession plans, SIGMA uses our Critical Role Identification Questionnaire to help management teams focus their planning efforts. The questionnaire suggests four relevant criteria to use in evaluating which positions are critical. Impact to business operations: How would day-to-day operations or business revenue be affected if this role was suddenly vacant? Availability of external candidates: Would it be difficult to find qualified external hires to replace this position? Internal bench strength: Are there qualified internal candidates who could step into this role today? Unique skillset or knowledge base: Does this role require skills or knowledge that would be difficult to replace, or demand specific experience in your company or industry? In addition, you may want to add other criteria to address your company’s specific needs or situation. For example, can you foresee an urgent need to replace a particular position, such as one where the incumbent will retire soon? Is there a role with a high risk of turnover, such as a very stressful position, one that’s in high demand externally, or is not competitively compensated? 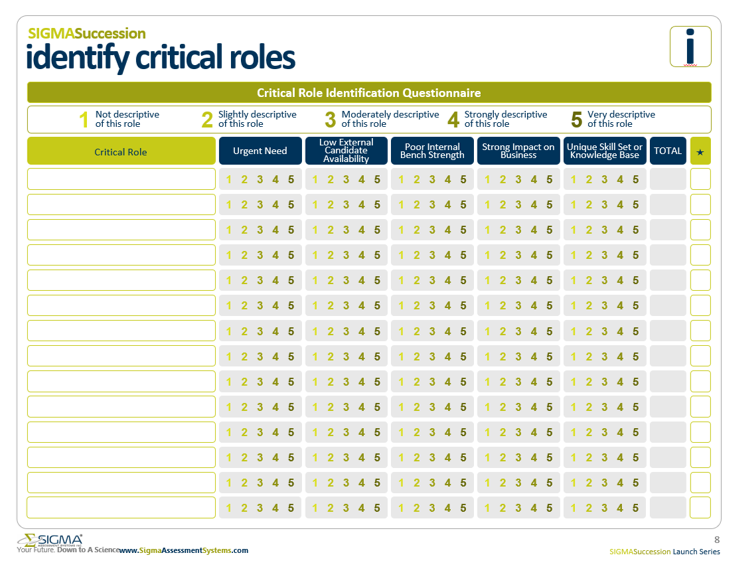 Use the Critical Role Identification Questionnaire to list all the roles in your company that the management team feels are most important to operations. While your C-suite leaders and senior managers may jump immediately to mind, it’s important to take an enterprise-wide approach and look for lynchpin roles at other levels as well. It’s better to be exhaustive in this step and use the evaluation process to reduce the list to just the most critical roles. The management team should then evaluate all the listed positions against the criteria on the form. It’s important to keep the position description in mind during your evaluation. Try not to focus only on the person currently in the role. Strong leaders often take on additional responsibilities outside their role, but you want to base your evaluation on the criticality of the core functions. By adding up the totals from all questionnaires, you’ll be able to develop a shortlist of key positions to consider for your succession plan. The management team should then take the time to discuss each of the criteria for all the shortlisted roles to pare the list down to the top role or roles to focus on initially. Smaller companies should select one position to concentrate on to begin their succession plan; larger companies may choose to move ahead with up to five positions. Starting small will make the process easier to manage and improve your likelihood of creating a successful plan. It will give you the chance to learn and gain insights, and enable you to build momentum as you move forward to expand the scope of your succession plan. Discover our Succession Planning solutions and how our Succession Planning Launch Series can help your organization select and develop the next generation of talent. Get our latest blog posts, industry news and new product information delivered right to your inbox. Sign up for our newsletter. [i] 2014 Report on Senior Executive Succession Planning and Talent Development. Institute of Executive Development and the Rock Center for Corporate Governance at Stanford University. [iii] Business succession planning: Cultivating enduring value: Volume 3 Developing future leaders. Deloitte.